If you wish to participate in the Team Fishing League this season, be sure to register and complete your team registration by tonight! Week 1 TFL matches will be available Monday, to be completed BEFORE Monday, March 7th. TFL Season 10 Registration is Underway! It's that time again! The Neo-Realms Team Fishing League (TFL) is a competitive, team-based tournament league for Neo-Realms Fishing. Players compete in 2v2 matches over the course of a season, with prizes going to the league victors. Registrations are open in Alston and close on Sunday, Feb 28th! If you are interested in sponsorship, please contact Sweegy Manilow. Special thanks to Windlight Magazine for sponsoring the league this year! Season 9 is Complete! 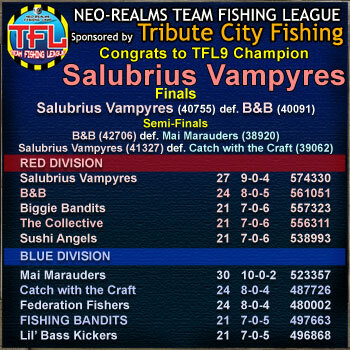 Congrats to Salubrius Vampyres! Season 9 is now over! Congrats to Salubrius Vampyres who won a close final over B&B! And the winner of our Season 9 Participation Drawing is Sushi Angels! Congrats! And special thanks to our league sponsor this season, Tribute City Fishing! Thanks to all players who participated, we hope everyone had fun and we will see you next season! The first round of a playoffs is over! 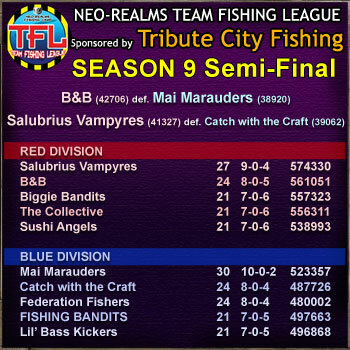 B&B have defeated Mai Marauders, and Salubrius Vampyres have reached the final by defeating Catch with the Craft. The regular season is done! 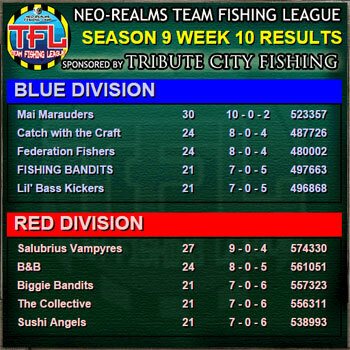 Congrats to Mai Marauders, Catch with the Craft, Federation Fishers, and FISHING BANDITS in Blue Division, and Salubrius Vampyres, B&B, Biggie Bandits and The Collective in Red Division for finishing in the prize money!